But then what happens when we miss a day?? “No biggie…I’ll just double up tomorrow and be fine!”, we think. OK, then tomorrow a family emergency re-routes our plans. Who cannot relate to that? OK, you’re dismissed, you can go play. There are a few things I’ve found vital to getting rid of overwhelm. One, I shared in this long blog post on learning to speak to your crocodile brain. If you do find yourself absolutely needing to do a huge task, and you’re procrastinating doing it, read that, and follow the steps. But for most of the goals and aspirations that are weighing you down and feel overwhelming, I’ll share 2 things that have helped me a lot. I have not been able to make the time to devote to my daily affirmation, emails from you, or writing as I would like and need to. I am still positive, hopeful and optimistic in general but I do lack in the time management area of my life. Instead of devoting daily time each morning/day for my 5MMM training, I have have an e-mail folder filled with emails to take the time and read and follow advice from which will take a lot of time to accomplish and go through. Any helpful suggestions would be great. Thank you for all you do!! Happy Friday!! I TOTALLY relate tot hat feeling…I can point to so many different times I have stacked up huge tasks of things I ‘want’ and feel I ‘need’ to do. 1st – LET IT GO AND START OVER! Yep, that’s it…just breathe a huge sigh of relief…I hereby release you from the burden of your past mountainous pile of ‘great things to do’! In the case of 5 Minute Mental Mastery, I’m sending a new email every day, so if you get behind, just let it go. Go back to it if you feel like it, but don’t feel obligated. And in the case of every other area you want to improve in life, how is it helping to feel burdened by a big stack of stuff you didn’t do yet but feel you ‘need’ to do? Just let it go…there will be plenty of new stuff coming your way each day I assure you. It’s great to have all your aspirations written down and filed away somewhere in case you ever want to get at them again…but why not just take today and live it fully? 2nd – Set a RIDICULOUSLY SMALL goals. There is ENORMOUS power in small….especially for those who are overwhelmed. Set a daily goal that is SO SMALL it feels almost laughable….then allow yourself to blow it out of the water. My daily goal today was to write 100 words. Seriously. That was my main goal for the day. I nailed it in about 2 minutes…success! And I had ZERO overwhelm blocking the way to getting started, because it was so ridiculously easy. Now I’ve written over 3000. 2900 bonus words! I knocked it out of the park and feel great. The beauty of this approach cannot be overstated. Read the book ‘Mini-habits’ if you doubt, or if you just want further help invoking the power of ‘un-overwhelm’ in your life. It’s an awesome book. P.S. 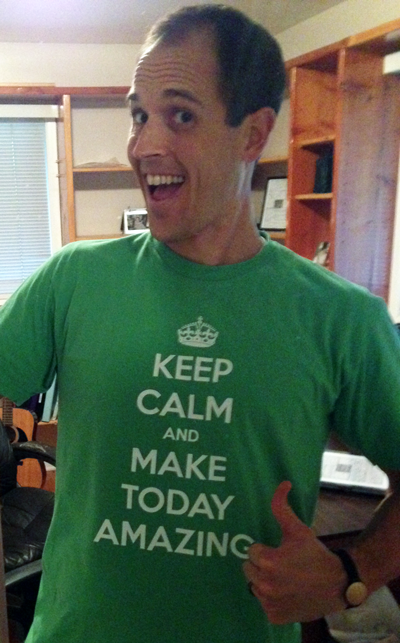 – I’ve got some cool gear available to help you Make Today Amazing! Thanks for the advice. Made me feel better immediately. How would one apply these concepts in the context of time constraints when the pressure is really getting to you. An exam that you have been studying for or task at work that is taking longer than expected and your boss is tightening the screws. Over the years I have really gotten into the habit of just quitting when maybe I should have just hung in there a little longer. Really the same advice applies regardless of the context. Maybe moreso when there’s pressure. Because you really can only focus on one thing, and you just need to get started. So choosing the smallest thing, and focusing exclusively on that will take your mind off the external pressure and place the focus on the action where it belongs. We just need to do whatever it takes to get moving on positive action and things will feel better.